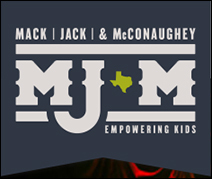 AUSTIN, TX (CelebrityAccess MediaWire) — Mack, Jack & McConaughey (MJ&M), the joint fundraising effort of ESPN analyst and legendary football coach Mack Brown, ACM award winning recording artist Jack Ingram, and Academy Award®-winning actor Matthew McConaughey, announce that legendary singer-songwriter and performer Toby Keith will headline its Gala Night on April 16, 2015 as part of MJ&M's two-day event in Austin, Texas. Toby Keith has been one of the most consistent self-directed songwriters and hit makers of his era. From his first number one smash, "Should've Been A Cowboy" to "How Do You Like Me Now?!" Keith’s unparalleled success is strongly due to his songwriting, which includes a number one song for 20 consecutive years. Keith has powered an astounding succession of hits to the tune of more than 85 million BMI performances. He has been honored with the Nashville Songwriters Association International's Songwriter/Artist of the Decade distinction and is a three-time BMI Country Songwriter/Artist of the Year and will be inducted into the Songwriter's Hall of Fame in New York City on June 18, 2015. His albums have sold more than 40 million copies, and his tours have drawn more than one million fans each year for the last 14 years. Grammy Award-winning country group, Little Big Town–consisting of members Karen Fairchild, Phillip Sweet, Kimberly Schlapman, and Jimi Westbrook– first entered the music scene more than 15 years ago with hits such as "Boondocks," "Bring It On Home," "Good As Gone" and "Little White Church." Their sixth studio album Pain Killer was released Tuesday, October 21st, to rave critical reviews. Pain Killer follows the bands platinum-selling album Tornado which includes #1 hits "Pontoon" and "Tornado." Collectively, the group has earned over 25 award show nominations and has taken home multiple awards including ACM Top New Vocal Group, CMA Single of the Year ("Pontoon"), CMA Vocal Group of the Year (2012, 2013, 2014), a Grammy Award for Best Country Group/Duo Performance ("Pontoon") and an Emmy award. Thursday April 16th MJ&M kicks off with the Gala, Live Auction, and a special Little Big Town performance followed by headliner Toby Keith at ACL Live. On Friday April 17th, MJ&M will continue with the success of the Celebrity Classic Golf Tournament at Spanish Oaks Golf Club. Also on Friday MILLY designer and founder, Michelle Smith, will hold a fashion show with Neiman Marcus at the W Hotel followed by the Jack Ingram & Friends concert at ACL Live presented by H-E-B with Jimmy Kimmel featuring Willis Alan Ramsey, Holly Williams, Christopher Coleman and Butch Walker.